The World Health Organization and the European Centre for Disease Control launched an investigation into how live Avian Bird Flu viruses (both H5N1 and H3N2) were accidentally mixed up with Bird Flu vaccines and shipped to 18 countries. US-based Baxter International accidentally sent an “experimental virus material,” which mixed H3N2 seasonal flu viruses and unlabelled H5N1 viruses, to an Austrian research firm. That company then shipped portions of the mixture to sub-contractors in the Czech Republic, Slovenia and Germany. How many people die of flu every year? How many died of swine flu? I don't think it's right to print the executives' home addresses and phone numbers in this comment where any nutcase could get a hold of it. They should be replaced with their business address/phone number/email instead, IMHO. Hello everyone. I just commented on the story regarding Baxter's "accidental" mix-up of H5N1 on the site Fierce Vaccines (found via Google News), and my comments were deleted and closed within approximately 40 minutes. There is obviously something criminal and HIGH LEVEL going on here with Baxter. I will include both the contact information of their executives as well as my own commentary regarding what I believe to be the public exposure of a vast international biological weapons program, or if you prefer, an international corporate criminal syndicate which intends to release biological weapons upon the world population. You initially claimed "trade secrets" regarding the vaccine contamination. Could you explain why Baxter initially attempted to cover this up? Amundson, Joy Ms. Joy A. Amundson is Baxter International Inc.'s Corporate Vice President — President, BioScience, having served in that capacity since August 2004. Prior to joining Baxter in August 2004, Ms. Amundson was a principal of Amundson Partners, Inc., a healthcare-consulting firm, from 2001. From 1995 to 2001, she served as a Senior Vice President of Abbott Laboratories. Despite popular media claims to the contrary, coinfection of H5N1 and H3N2 would _not_ produce simple reassortment. It would produce complex in vivo recombination of many competing strains in the infected host. Does Baxter agree with this assessment? Arduini, Peter Mr. Peter J. Arduini is Baxter International Inc.'s Corporate Vice President — President, Medication Delivery. Prior to joining Baxter in March 2005, Mr. Arduini spent 15 years at GE Healthcare in a variety of management roles for domestic and global businesses, the most recent of which was global general manager of GE Healthcare’s computerized axial tomography scan (CT) and functional imaging business. Furthermore the complex coinfection of H5N1 and H3N2 in a human would produce natural selection pressure for maximum virulence. Does Baxter dispute this claim? If so, why? If not, please explain why on earth would Baxter attempt to cover up an incident which may well have been lethal to 99% of humanity? Baughman, Michael Mr. Michael J. Baughman is Baxter International Inc.'s Corporate Vice President and Controller, having served in that capacity since May 2006. Mr. Baughman joined Baxter in 2003 as Vice President of Corporate Audit and was appointed Controller in March 2005. Before joining Baxter, Mr. Baughman spent 16 years at PricewaterhouseCoopers LLP, in roles of increasing responsibility, which included audit partner and partner in the firm’s mergers and acquisitions practice. The book "Evolutionary Dynamics" suggest that viral coinfection selects for both maximum virulence and infectivity. Does Baxter dispute these mathematics? Considering this danger is well known among virologists, can Baxter immediately explain the precise sequence of events, including dates, times, and people involved, which led to contamination in over 16 labs in three separate countries in Europe with coinfected H5N1 and H3N2 material? Gatling, James Mr. James Michael Gatling is Corporate Vice President — Manufacturing of Baxter International Inc. having served in that capacity since December 1996. Mr. Gatling is also responsible for the environment, health and safety function. Is Baxter prepared to cooperate with all relevant authorities in the multiple countries to publicly release the genetic sequences of the contaminated material? Furthermore, what Clade was Baxter's H5N1 vaccine from? Clade 1? Clade 2? Clade 3? Other? Is part of the reason Baxter is so eager to destroy the existing vaccine material that executives are concerned the world will find out their 'custom' H5N1 does not resemble the strains circulating in waterfowl? Gavin, James James R. Gavin III, M.D., Ph.D. has served as a Director of Baxter since 2003. Since September 2007, Dr. Gavin has been Chief Executive Officer and Chief Medical Officer of Healing Our Village, Inc., a corporation that specializes in targeted advocacy, training, education, disease management and outreach for health care professionals and minority communities. From March 2005 to September 2007, Dr. Gavin served as Executive Vice President for Clinical Affairs at Healing Our Village. Dr. Gavin has served as Clinical Professor of Medicine and Senior Advisor of Health Affairs at Emory University since January 2005. From January 2006 to July 2007, Dr. Gavin served as President and CEO of MicroIslet, Inc., a biotechnology company focused on transplantation therapy for insulin treated diabetics. From July 2002 to January 2005, Dr. Gavin was President of the Morehouse School of Medicine and from 1991 to July 2002 he was Senior Science Officer at Howard Hughes Medical Institute, a nonprofit medical research organization. From 1987 to 1991, he was at the University of Oklahoma Health Sciences Center as a Professor and as Chief of the Diabetes Section and Acting Chief of the Section on Endocrinology, Metabolism and Hypertension. Dr. Gavin also serves as a director of Amylin Pharmaceuticals, Inc. and Nuvelo Inc.
Can Baxter please disclose all financial and social connections it has with the incoming Obama administration (as Baxter and its executives are based near Chicago) and whether Baxter stood to benefit financially from the outbreak of a pandemic through a contaminated season influenza vaccine in late 2009? Does Treasury Sec Geithner hold shares in Baxter? If so, how many shares? Greisch, John Mr. John J. Greisch is Baxter International Inc.'s Corporate Vice President — President, International, having served in that capacity since May 2006. From June 2004 to May 2006, he served as Corporate Vice President and Chief Financial Officer and from January to June 2004, he was Corporate Vice President — President, BioScience. Prior to that, Mr. Greisch served as Vice President of Finance and Strategy for BioScience from May 2003 to January 2004 and as Vice President of Finance for Renal from March 2002 until April 2003. Prior to joining Baxter, he was President and Chief Executive Officer of FleetPride Corporation, a distribution company, from 1998 until 2001. Baxter Director Gail Fosler has profoundly disturbing connections to powerful organizations including the Council on Foreign Relations, high-level Chinese CCP leadership, and the Federal Reserve Bank of New York. The question is simple: Is Baxter involved in biological weapons programs? Are any of these programs 'international' in scope? If so , who is providing the funding? What is the nature and intent of these programs? Are any of these programs part of the so-called 'black budget'? That is , is Baxter involved in any "Special Access Programs" , as defined by Congress? Are any of these 'waived' "Special Access Programs"? Are any of these 'unacknowledged' 'waived' Special Access Programs (also known as 'black programs')? Hellman, Peter Peter S. Hellman has served as a Director of Baxter since March 2005. Mr. Hellman served as President and Chief Financial and Administrative Officer of Nordson Corporation, a manufacturer of systems that apply adhesives, sealants and coatings during manufacturing operations, from March 2004 until his retirement in January 2008. From February 2000 to March 2004, Mr. Hellman served as Executive Vice President and Chief Financial and Administrative Officer of Nordson Corporation. From 1989 to 1999, Mr. Hellman held various positions with TRW Inc., the most recent of which were President and Chief Operating Officer. Mr. Hellman also serves as a director of Qwest Communications International Inc. and Owens-Illinois, Inc.
Can Baxter explain exactly how a Level 3 biological warfare pathogen found its way into H3N2 material, regardless whether or not this experimental vaccine material was 'intended' for eventual use in humans or not. Is the contaminated H5N1 strain genetically engineered? If so, by whom? 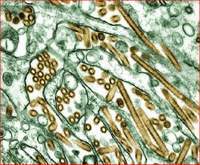 Does the NS protein in Baxter's H5N1 material contain polymorphisms which suppress human interferon production? Was Baxter's H5N1a full set of influenza genes? Or was it just the hemaglutanin and neuraminidase? Did Baxter's H5N1 contain a poly-basic cleavage site on the Hemaglutanin surface protein? Why were the samples of experimental vaccine material not irradiated? Lichtenstein, Susan Ms. Susan R. Lichtenstein is Corporate Vice President and General Counsel of Baxter International Inc. Prior to joining Baxter in April 2005, Ms. Lichtenstein was a partner with McDermott Will & Emery. She joined the law firm after having served as General Counsel to the Governor of Illinois from 2003 to 2004. Ms. Lichtenstein served as Senior Vice President, General Counsel and Corporate Secretary for Tellabs, Inc. from 2000 to 2002. From 1994 to 2000, Ms. Lichtenstein held several positions with Ameritech Corporation, including Senior Vice President, General Counsel and Corporate Secretary from 1999 to 2000. Are Baxter executives prepared to testify before Congress , under oath, that their corporation is not involved in biological warfare programs? Martin, Joseph Joseph B. Martin, M.D., Ph.D., has served as a Director of Baxter since 2002. Dr. Martin serves as Professor of Neurobiology at Harvard Medical School. From July 1997 to July 2007, Dr. Martin served as Dean of the Harvard Faculty of Medicine. He was Chancellor of the University of California, San Francisco from 1993 to 1997 and Dean of the UCSF School of Medicine from 1989 to 1993. From 1978 to 1989, he was chief of the neurology department of Massachusetts General Hospital and Professor of Neurology at Harvard Medical School. Dr. Martin also serves as a director of Scientific Learning Corp.
President of Baxter Corporation in Canada. Do Baxter executives have any financial and/or personal connections to Toyama Pharma and T-705, an influenza polymerase inhibitor? Has Baxter experimented with influenza polymerase inhibitors? Will Baxter disclose precisely what its financial positions are regarding H5N1 pandemic 'therapy' included its intended market timelines? The 'contamination' was an extremely serious breach of risk as Baxter could have easily exterminated most of the human race if this experimental material was made into vaccines. Parkinson, Robert Mr. Robert L. Parkinson, Jr., is Chairman and Chief Executive Officer of Baxter International Inc., having served in that capacity since April 2004. Prior to joining Baxter, Mr. Parkinson was Dean of Loyola University Chicago’s School of Business Administration and Graduate School of Business from 2002 to 2004. He retired from Abbott Laboratories in 2001 following a 25-year career, having served in a variety of domestic and international management and leadership positions, including as President and Chief Operating Officer. Mr. Parkinson also serves on the boards of directors of Chicago-based Northwestern Memorial Hospital and the Northwestern Memorial Foundation as well as Loyola University Chicago’s Board of Trustees. Why does Baxter hold patents on avian influenza RNA polymerase promoters? What legitimate public health and/or scientific interest does Baxter have in this research? (see Application number: 10/547,155, Publication number: US 2007/0134270 A) Will all Baxter executives come forward and immediately renounce weaponization of biologics? Are Baxter executives concerned about possible civil and/or criminal actions brought against them? Why or why not? Riedel, Norbert Mr. Norbert G. Riedel is Corporate Vice President and Chief Scientific Officer of Baxter International Inc., having served in that capacity since May 2001. From 1998 to 2001, he served as President of the recombinant business unit of BioScience. Prior to joining Baxter, Dr. Riedel was head of worldwide biotechnology and worldwide core research functions at Hoechst Marion Roussel, now Sanofi-Aventis. What are the financial connections between the Federal Reserve System and Baxter? Does Baxter receive funding from JP Morgan or Goldman Sachs? Does Baxter receive any national security exemptions (waivers)? Terrell, Karenann Ms. Karenann K. Terrell is Corporate Vice President and Chief Information Officer of Baxter International Inc. Prior to joining Baxter in April 2006, Ms. Terrell was with DaimlerChrysler Corporation from 2000 where she served in various positions, the most recent of which was Vice President and Chief Information Officer, Chrysler Group and Mercedes Benz North America. Prior to that, she spent 16 years with General Motors with responsibility for brand development and e-business management. What specific steps , including a precise timeline, does Baxter plan on doing to allay the concerns of both the public and the scientific community? Again, can Baxter please describe the precise nature of their H5N1 strain, including genetic sequences, from where it was obtained, and whether it was genetically engineered? If genetically engineered, what modifications were made? Single nucleotide polymorphisms? RNA Recombination? Reassortment? What exactly, was in this experimental vaccine material? We want scientific answers immediately. White, Cheryl Ms. Cheryl L. White is Corporate Vice President, Quality of Baxter International Inc., having served in that capacity since March 2006. From 1997 to 2006, Ms. White held various management positions in Baxter’s BioScience business, the most recent of which was Vice President, Quality Management.